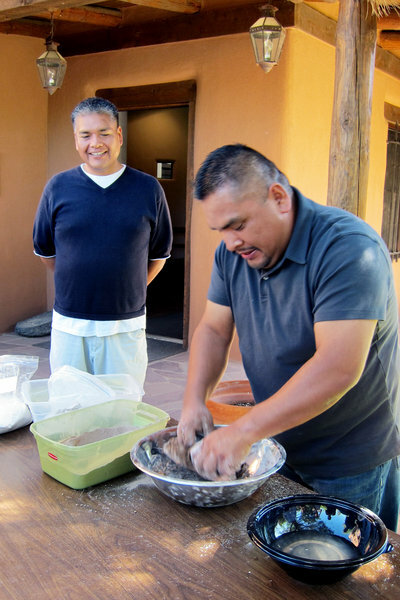 In 2012–2013, the Indian Arts Research Center (IARC) at the School for Advanced Research (SAR) brought together seven potters from San Felipe Pueblo to discuss pottery making in their community. 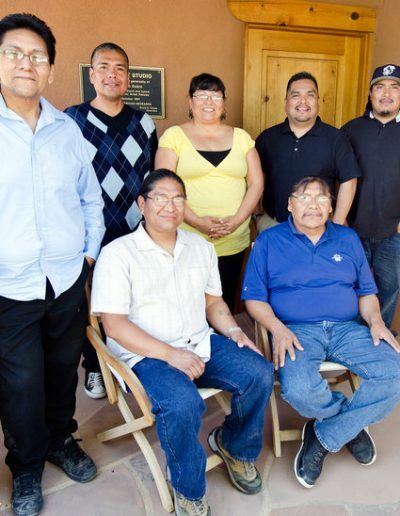 The potters met four times over the course of two years to grapple with various issues such as how to define pottery from San Felipe and what it means to be a potter from the Pueblo. 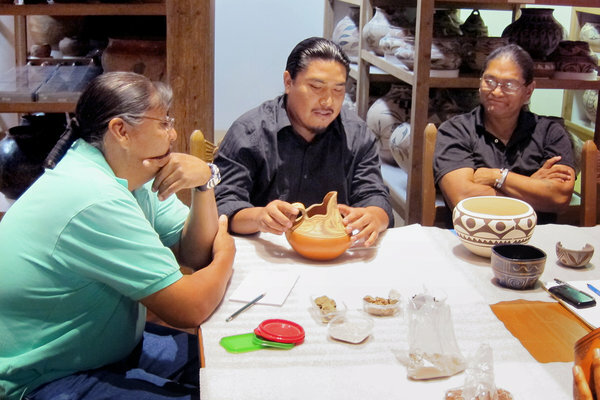 During their meetings, they also shared ideas, materials, and techniques related to creating pottery. The seven potters included Daryl Candelaria, Gerren Candelaria, Hubert Candelario, Ray Garcia, Joseph Latoma, Geraldine Lovato, and Ricardo Ortiz. Virtually unknown to the general public, San Felipe pottery is rarely mentioned in publications and sparsely represented in major museum collections. Institutions like the Smithsonian’s National Museum of the American Indian and the Heard Museum have fewer than a dozen pieces in their massive collections. 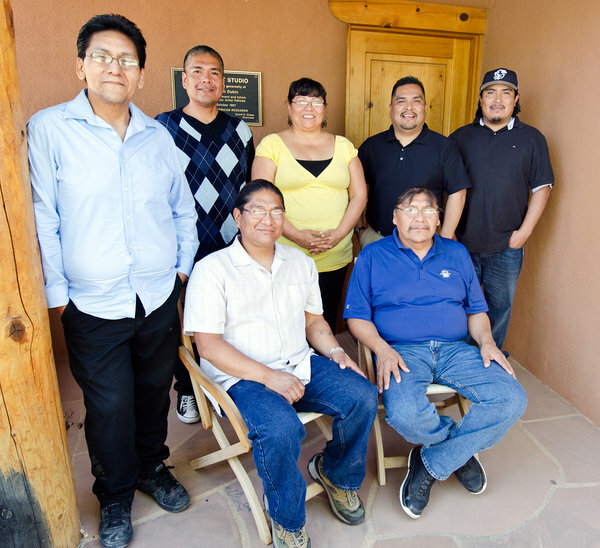 Located in the heart of Pueblo country, the Museum of Indian Arts & Culture and the Indian Arts Research Center have only seventeen and thirteen pieces respectively. 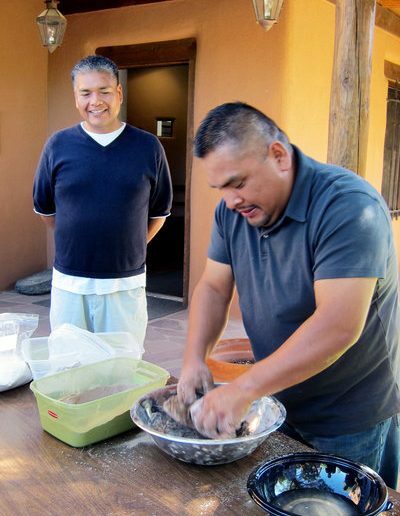 The potters know their Pueblo has a rich history, and through this exhibition, they wish to share the dynamic and diverse tradition of pottery making in their community. Left to right: Ricardo Ortiz, Gerren Candelaria, and Ray Garcia. During the seminars, each potter discussed his or her own work, explaining their inspirations, methods, and aesthetics. Here, Gerren shares information about the form and designs on his pitcher.